Scott Kazmir was pretty fantastic in July. Scott Kazmir has only been a member of the Houston Astros for two weeks but he’s already picked up a major award. 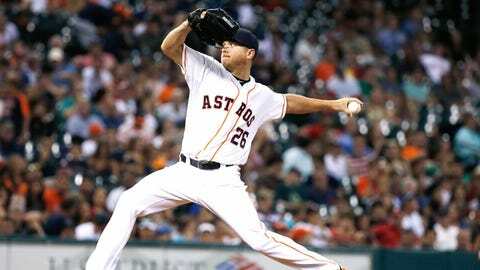 On Monday, Kazmir was named the American League Pitcher of the Month for July. In that span, he went 2-0 with a 0.26 ERA in five starts, three of them as a member of the Oakland Athletics. In his two starts with Houston so far, the lefty has thrown 14 2/3 scoreless innings, allowing six hits and picking up eight strikeouts. When asked by MLB.com’s Brian McTaggart about the honor, Kazmir didn’t hide his feelings: "It’s a huge honor. The whole month has gone the way I wanted to, just from the fact of being able to hit my spots and stuff like that. I’m excited." McTaggart also noted that Kazmir’s 0.26 ERA for the month of July is the third-lowest by any one pitcher in that month in MLB history, coming behind Frank Allen (0.25 in 1916) and Spudd Chandler (0.24 in 1941)…so Kazmir is in good company. Split between the A’s and Astros so far in 2015, Kazmir is 6-5 with an AL-best 2.10 ERA.